I had a great time and went to so many great sessions at this year’s GCTE Conference at Callaway Gardens. This first session I attended explored the use of Plasq’s Comic Life software in school projects (Kristen Kallaher, Stone Mountain High School). I have Comic Life on my Mac, and I use it to make cool handouts for my classroom, but I hadn’t thought about getting it installed in our computer lab so students could create projects. I find there is a bit of a learning curve with Comic Life. Still, it’s an idea worth exploring. Long-time readers of this blog know about my struggles with grading as a form of assessment. If I have to use grades, I want them to reflect what students have truly learned. Sisters Laura Cook (South Effingham High School) and Elizabeth Self presented a session on Grading What Matters that I found intriguing. One thing Laura Cook does is she doesn’t penalize students’ points for late work. Instead, she assigns them lunch detention until the work is completed. In her words, it’s a behavior issue and should therefore be addressed with consequences for the behavior. I like that idea and would like to talk about it further with my department and other faculty at my school. Update: I forgot to include a link to Laura and Liz’s blog, where you can find materials shared at their session. Lawrence Scanlon presented Integrating Nonfiction into the Curriculum: An Introduction to Rhetoric. My department chair and I have been discussing changes in the curriculum along these lines. What is funny is that she e-mailed me prior to the conference and asked me to go to this session if I could, but if there was something else I preferred, she said that was OK. Well, I went through the descriptions, settled on this session, and went. Then I realized it was the one she wanted me to go to. We are so in tune with each other that it’s spooky. This session was great. One thing I took away from it was solid tools to help students to craft an argument that I can use immediately. I am interested in multigenre research papers and attended a session last year presented by Buffy Hamilton (who has since become an online friend). This year, Robert Montgomery and his students at Kennesaw State University presented their multigenre research papers, and I learned some new ways to incorporate this valuable writing experience into my classroom. I also really need to finish Tom Romano’s book. My last session on Friday was presented by a teacher candidate from UGA (Eric Slauson) on incorporating science fiction into the classroom. I chose to go to this session because of my Joseph Campbell class. Slauson did a particularly good job pairing science fiction offerings with canon books. The final session of the conference took place on Saturday, and I chose to attend Ike Thompson’s (Houston County High School) presentation of Literature Circles. I am very interested in doing more with literature circles, and Thompson’s presentation gave me lots of good ideas. He applied for a mini-grant from GCTE in order to populate his classroom library. I have been researching grant opportunities aside from this mini-grant, and I find that many grant opportunities are limited to public school teachers. I understand why. It makes complete sense to me. But I need to find a way to get a solid classroom library, too. I guess my department chair and I will just need to put our heads together and think. Saturday night I had dinner and excellent conversations with colleagues from across the state. We moved on to trivia after dinner, and our team won. I absolutely love trivia. My favorite board game is Trivial Pursuit. I need to get in on some local trivia deal so I can keep sharp. Nothing beats being recognized by your own colleagues. When you update as seldom as I have lately, it seems posts are destined to become a mishmash of assorted thoughts as I catch everyone up. First, as you can see from the sidebar, I am supporting NCTE’s National Day on Writing. I am not sure exactly what I and my students will do, but I would like to make a big deal out of it at my school and perhaps support our literary magazine in the process. Speaking of literary magazines, my daughter is in the literary magazine class at school, and it sounds like the coolest class ever. Her teacher lets them work on whatever writing they want, and they are guaranteed to have a submission published in the magazine. My daughter loves to write, and she starts lots of projects, but I hope a class like this will encourage her to finish one. Her teacher told us on Curriculum Night that students can write poetry, short stories, or even spend the time working on their novel. I was so impressed to hear a teacher talking about students writing novels. I didn’t ask if he’s going to encourage the kids to participate in NaNoWriMo. I can’t think of a year when I’ve wanted to participate more myself, but alas, grad school will most likely make that unfeasible. There’s always next year, by which time (cross your fingers) I plan to have graduated. Speaking of grad school, this semester finds me in Graphic Design for Electronic Presentations, Telecommunications and Distance Learning, Software Evaluation, and Digital Video. I am finding it hard to get motivated to work. The degree at the end of my studies has become my carrot. One thing I have learned from my classes, and I believe it’s possibly an unintended lesson, is that students need the clearest possible instructions before they begin an assignment and that rubrics must be clear. I have turned in quite a few assignments over the course of last spring and beginning this fall in which instructions and rubrics were not clear, and I feel I lost points because of problems with instructors rather than my own work. If I do not follow directions, I expect to lose points, but it’s a shame when it’s because an instructor is not clear. I do think it’s helped my own teaching. Who wants to play the game of what does she want? How many points do you think she’ll take off for this arbitrary thing I didn’t even know I did? Looping back to the National Day on Writing, I have a complaint to lodge about NCTE’s website. I followed a tweet by Kylene Beers to add a badge to my blog in support of the National Day on Writing. 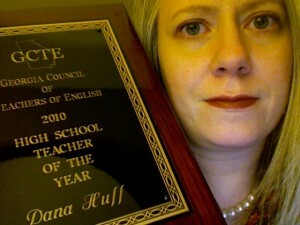 She sent her followers on Twitter to the main NCTE page. I had to hunt around for the National Day on Writing information, and even then, I couldn’t find the badges until I used the search feature (here it is, by the way, so you don’t have to hunt). Folks, we are working with teachers of all sorts of levels of technological ability, and it’s not the first time I have had to hunt all over the NCTE website for something they’re actively promoting, which to me means it should be screaming from every page. Am I alone in this, or does anyone else find their website a bear to navigate? I also have never had a response from either Traci Gardner or NCTE about the fact that the companion site for Designing Writing Assignments is missing. In other news, I upgraded my Mac to Snow Leopard, and I like most of the improvements, though I haven’t had a chance to play with many of them. My favorite Twitter client, Nambu, is broken in Snow Leopard and those folks move about as fast as Christmas when addressing issues like that. I understand that it’s free software, and it’s in beta, so I don’t complain, but I do miss the software. Tweetdeck just doesn’t do it for me, but I find I can’t keep up at all unless I use a Twitter client. Aside from all these thoughts, I’ve barely had time to talk about school. I have some great classes this year. My Hero with a Thousand Faces class is full, and a lot of students who requested it were not able to get in. Considering we had about half capacity last year, that tells me the word on the street is pretty good, and that makes me happy because I designed this class from the ground up. It’s a study of Joseph Campbell’s monomyth and Jungian archetypes. So far we have learned about Campbell’s ideas. To get rolling, I had students split up the section with the three parts of the hero’s journey and present their findings in groups. Then, I used a wonderful SMARTBoard notebook file (I think you need to be a member of TeqSmart to download, but it’s free) I found by James Longwell-Stevens to review our presentations. We are currently in the midst of a study of The Iliad. I found a great portfolio with lesson plans shared by a student teacher, and the calendar has been extremely helpful to me in planning. I also used some of the student teacher’s ideas. I will let students select our next text to study. My British lit. classes are also off to a great start. We are in the middle of Beowulf. I am tweaking my performance task slightly. In the past, I’ve had students create Beowulf’s résumé as a culminating activity, but I think this year, they will write from Hrothgar’s point of view to some made up king (or queen—perhaps Queen Huffgar the Wise?) recommending Beowulf for the job of monster-killer. The premise is the same. They need to do the same close reading. The format will be different, but the audience is essentially the same, too. I can still require the annotation piece, as well. Of course, I have also totally stolen Joe Scotese’s wonderful Beowulf ideas as well. No one can put together a close-reading exercise like Joe. He’s a master. My ninth grade class is wrapping up a study of Mark Haddon’s The Curious Incident of the Dog in the Night-Time. All in all, it’s been a good start, folks are engaged (or else they are good actors, which I don’t discount), and I am enjoying school very much. My family and I enjoyed the Decatur Book Festival yesterday. It was exciting to be among so many book lovers. We really enjoyed the Georgia Shakespeare Festival‘s Will Power troupe, who did a production of Alice in Wonderland. It was a great day, even if I wasn’t able to see Diana Gabaldon after all. You can read more about it on my book blog. Before I go, I will put in a plug for Plasq’s Comic Life software, which enables you to create handouts that look like comics (or, indeed, to create comics). They have some great layouts and fonts, and they have a great educational discount. I only paid $19.95 for the educators’ version of the software, which enables me to install it on Mac and Windows, or at least that’s my understanding. I downloaded it on my Mac, but I haven’t tried to put it on my desktop at work, yet. At any rate, it’s a fairly low price and a substantial discount, and if you like making funky handouts, it’s worth it. Right. I’d better start my Telecommunications and Distance Learning homework, and I have an assignment from another class I need to resubmit now that I understand what I was supposed to have done the first time (but never mind, I’ve already complained about that).